I think it's so neat that you and I both baked as a way to honor our mothers. 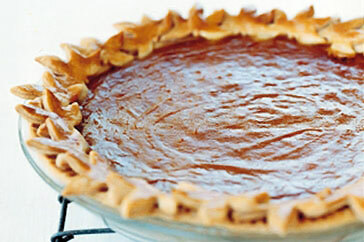 I get in a rut of thinking pumpkin pie equals Thanksgiving, but really, it's delicious any time` I'm glad that you and your mother had a change to at least see each other through the Skype-thing. Your garden sounds delicious! My mum would love to have wireless internet and a laptop so that she could show me around her garden - unfortunately I wouldn't have much to show her in return!! Dolce - I'm sure cooking is a universally common bond between mothers and their daughters. Thanks for you encouragement. Karen - we'll have to attend to your garden soon so you do have something to show!